Ed Durkin, also known as Mr. Ed, was a champion swimmer and has been teaching children to swim for over 10 years. Mr. Ed is a successful business man who rekindled his love of swimming after he retired from business. He has taught thousands of children to swim around the world. Mr. Ed loves children, having 6 of his own and 13 grandchildren. 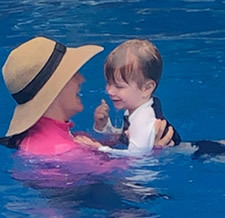 Karen Burke, also known as Mrs. Karen, is a certified swim instructor and has been teaching with Mr. Ed since 2014. She has taught hundreds of children to swim across the country and is passionate about teaching children how to be safe in and around the water. Karen and her husband have 3 children, all of whom love to swim after completing Mr. Ed's program. Copyright © 2019 Swim Safe, LLC and Ed Durkin, Inc. All rights reserved. If you have a heated pool, please consider hosting your own class. There are several benefits for this including free lessons for your children. In order to travel, I would need a minimum of 20 students to start with. Call for details and references as far in advance as possible to secure the week you would like.